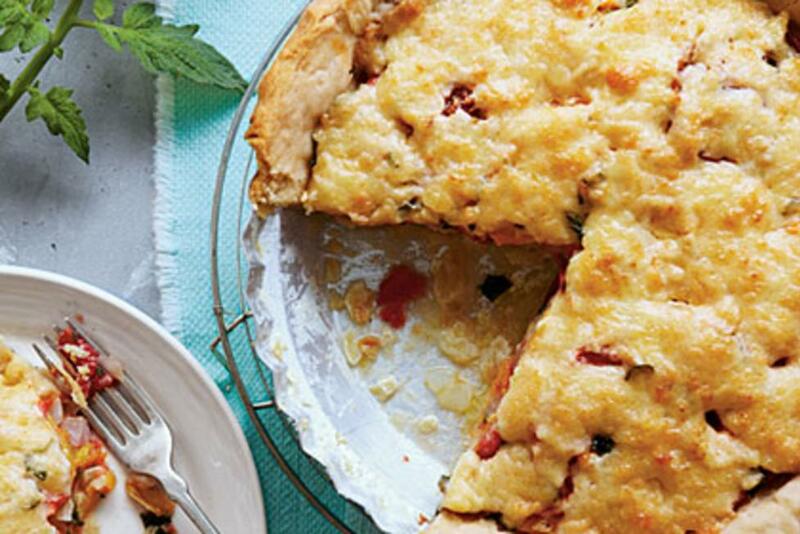 Old-fashion Tomato Pie is summer perfection thanks to garden fresh tomatoes and herbs. When you serve Old-fashion Tomato Pie, this plate of goodness is always a home run. 1. Prepare pie crust: Process first 4 ingredients in a food processor until mixture resembles coarse meal. With processor running, gradually add 3 Tbsp. ice-cold water, 1 Tbsp. at a time, and process until dough forms a ball and leaves sides of bowl, adding up to 1 Tbsp. more water, if necessary. Shape dough into a disk, and wrap in plastic wrap. Chill 30 minutes. 2. Unwrap dough, and place on a lightly floured surface; sprinkle lightly with flour. Roll dough to 1/8-inch thickness. 3. Preheat oven to 425°. Press dough into a 9-inch pie plate. Trim dough 1 inch larger than diameter of pie plate; fold overhanging dough under itself along rim of pie plate. Chill 30 minutes or until firm. 4. Line pie crust with aluminum foil; fill with pie weights or dried beans. (This will keep the crust from bubbling up.) Place on an aluminum foil-lined baking sheet. 5. Bake at 425° for 20 minutes. Remove weights and foil. Bake 5 minutes or until browned. Cool completely on baking sheet on a wire rack (about 30 minutes). Reduce oven temperature to 350°. 6. Prepare Filling: Place tomatoes in a single layer on paper towels; sprinkle with 1 tsp. salt. Let stand 10 minutes. 7. Meanwhile, sauté onion and 1/4 tsp. each salt and pepper in hot oil in a skillet over medium heat 3 minutes or until onion is tender. 8. Pat tomatoes dry with a paper towel. Layer tomatoes, onion, and herbs in prepared crust, seasoning each layer with pepper (1 tsp. total). Stir together cheeses and mayonnaise; spread over pie. 9. Bake at 350° for 30 minutes or until lightly browned, shielding edges with foil to prevent excessive browning. Serve hot, warm, or at room temperature.